Jim Weatherly, Hall of Fame Songwriter, and author of "Midnight Train" will sign his book at Museum Moments, October 25th. 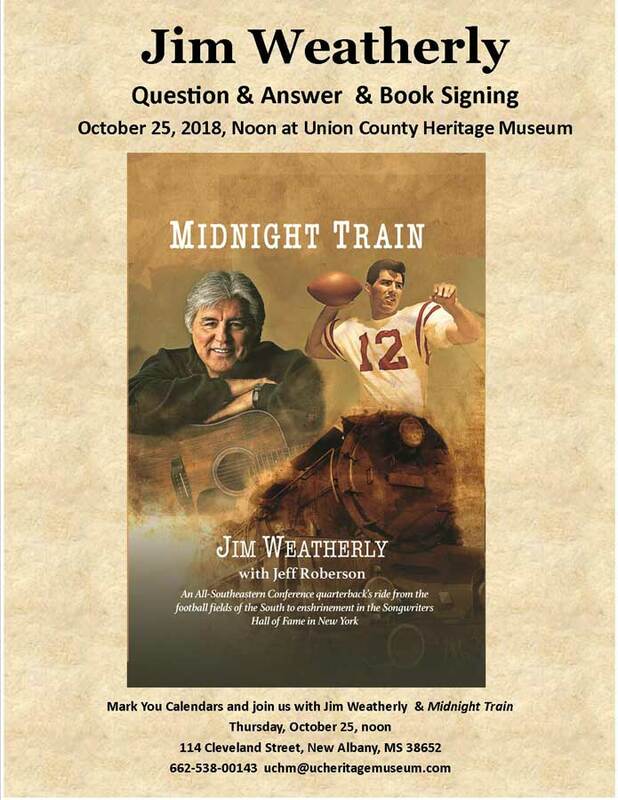 Jim Weatherly, musician, songwriter, athlete and now author will be at the Union County Heritage Museum on Thursday, October 25, noon for a question and answer session and book signing. His new book Midnight Train is a memoir of his life in sports and show business. Weatherly, born in Pontotoc County, has been writing songs for almost 50 years, and was inducted into the Songwriters Hall of Fame in 2014. His best-known composition is “Midnight Train to Georgia” recorded by Gladys Knight & the Pips. Known for many talents, Weatherly played for legendary Ole Miss Coach Johnny Vaught as an All-Southeastern Conference quarterback and was an honorable mention All-American on the 1964 team. Football fans also remember he was also a member of the only unbeaten and untied national championship squad in University of Mississippi history in 1962, which was the team that captured the SEC championship that year and again in 1963. Locally, people who were teens at that time period remember his band playing for area dances. There will be a light lunch served beginning at 11:30AM. The public is invited to attend this free event. For more information call the museum at 662-538-0014. The museum is located at 114 Cleveland Street in New Albany. SkyWatcher Alert: Have you heard about the Black Moon?